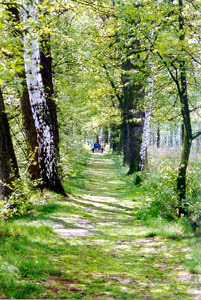 ...is a 250 mile long network of hiking and biking trails between Prague and Vienna. Travelers can walk or bike between historic towns and villages, visit romantic castles, medieval churches and monasteries, discover old Jewish sites and savor some of the most picturesque countryside in Europe. The routes stretch along the Vltava River Valley in Southern Bohemia and the Dyje River Valley in Southern Moravia, the settings of numerous folk and music festivals. The Prague-Vienna Greenways project is managed by the Greenways-Zelené stezky program of Nadace Partnerství (Environmental Partnership for Sustainable Development) in Brno, Czech Republic. Its mission is to restore and preserve the natural and cultural heritage of the region, and develop sustainable tourism. By supporting local initiatives through grants and technical support, the Greenways-Zelené stezky Program promotes the understanding of the greenways concept. The Prague-Vienna Greenways project was conceived in 1990s by the late Lubomir and Tiree Chmelar from New York, and made a reality thanks to their admirable commitment and work. Please help us keep their legacy alive by supporting their latest beloved project, a unique herb garden at Valtice Chateau, opened in 2010. It has been named The Lu & Tiree Chmelar Herb Garden in Valtice in their honor.